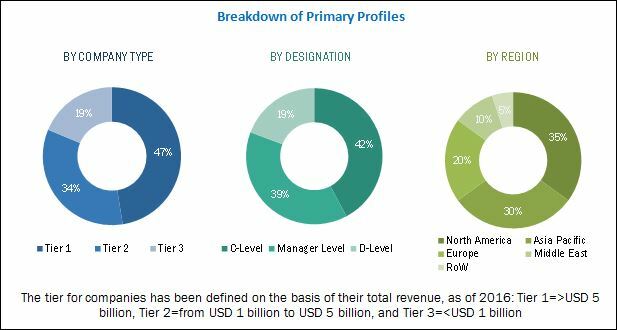 [146 Pages Report] The global portable filtration systems market was valued at USD 495.5 Million in 2016 and is expected to grow at a CAGR of 3.93%, from 2017 to 2022. The portable filtration system is a type of offline filtration unit, where the fluid can be pumped out of the reservoir, passed through the filter, and is allowed to return in a continuous fashion, independent of the operation of the main hydraulic circuit. The portable units can be moved from one reservoir to another for servicing multiple machines. Factors, such as stringent government regulations aims at reducing environmental degradation across the world, upcoming power projects, and implementation of the filtration technology to reduce the emission of harmful pollutants in power plants coupled with rapid industrialization in emerging economies, thus driving growth in the portable filtration systems market. This research study involved the use of extensive secondary sources, directories, and databases, such as Hoover’s, Bloomberg Businessweek, Factiva, and OneSource, to identify and collect information useful for a technical, market-oriented, and commercial study of the global portable filtration systems market. Primary sources are mainly industry experts from core and related industries, service providers, technology developers, standard and certification organizations of companies, and organizations related to all the segments of this industry’s value chain. The ecosystem of portable filtration systems comprises companies such as Parker-Hannifin (US), Pall (US), Bosch Rexroth (Germany), Eaton (Ireland), Donaldson Company (US), HYDAC International (Germany), Walter Stauffenberg (Germany), and Y2K Fluid Power (US). The global portable filtration systems market is projected to grow at a CAGR of 3.93%, from 2017 to 2022, to reach a market size of USD 621.4 Million by 2022. This growth is attributed to stringent environmental regulations aimed at reducing environmental degradation, growth of the power generation segment, and rising manufacturing activities, mainly in emerging economies. The report segments the portable filtration systems market, on the basis of technology, into pressure filtration, centrifugal filtration, and vacuum filtration. The pressure filtration segment led the portable filtration systems market in 2016, and is projected to dominate the market during the forecast period. Moreover, the pressure filtration technology is preferred over centrifugal filtration as the latter only removes free water and has high initial and operating costs, which is driving the growth in the pressure filtration systems market. The portable filtration systems market has been segmented, based on flow rate, into 0 to 10, >10to 20, >20 to 60, >60 to 100, and above 100 GPM segments. The 0 to 10 GPM segment is the most common flow rate and has application in most industrial processes. Moreover, the comparatively less cost of small portable filtration systems with low flow rates and a high to medium viscosity range is driving the market for the 0 to 10 GPM segment. The portable filtration systems market has been segmented on the basis of end-user into manufacturing, power generation, oil & gas, paper and pulp, petrochemicals, and others. The power generation segment is the largest contributor to the portable filtration systems market and also acts as a key driver of the market. 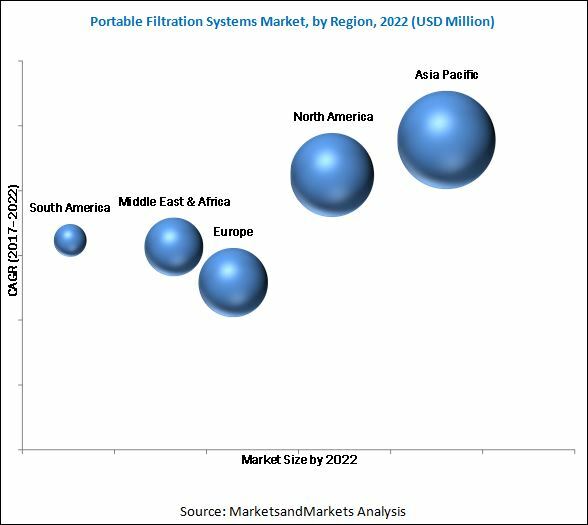 The portable filtration systems market is further driven by rapid industrialization and an increase in manufacturing activities, specifically in Asian countries, due to favorable government policies that have significantly boosted the growth of the manufacturing sector. In this report, the portable filtration systems market has been analyzed with respect to five regions, namely, North America, Europe, Asia Pacific, Middle East and Africa, and South America. The market in Asia Pacific is expected to dominate the global portable filtration systems market, during the forecast period, owing to increase in power generation capacity and growth in the manufacturing sector in the region, especially in countries such as India and China. Emerging alternate and renewable energy sources and availability of cheap alternatives could be the restraints for the portable filtration systems market. Leading players in the portable filtration systems market are Parker-Hannifin (US), Pall (US), Bosch Rexroth (Germany), Eaton (Ireland), and Donaldson Company (US). New product launches was the strategy most commonly adopted by top players, constituting 49% of the total developments, from 2014 to September 2017. It was followed by mergers & acquisitions.